June 1, 1936: On this day, The NBC Blue network's program host, Cecil B. DeMille, introduced Clark Gable and Marlene Dietrich in "The Legionnaire and The Lady" and The Lux Radio Theater radio show moved from New York City to Hollywood. The Lux Radio Theater was one of the longest-running classic radio dramas. During its first season, they were performing Broadway stage plays. 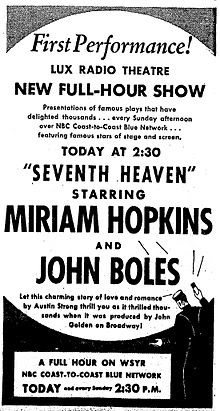 The program, which lasted for hours, was performed before a live audience. When their sponsor moved the show from New York to Hollywood, The Lux Radio Theater also shifted from using Broadway plays into adopting movies.